Australian botanical brand Aesop will launch Tacit, a new fragrance inspired by traditional Eau de Cologne and the aromas of the Mediterranean. Tacit was developed by perfumer Céline Barel. Notes include citrus, basil and vetiver. 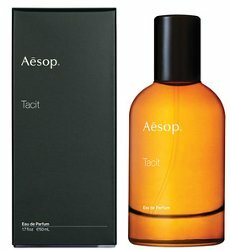 Aesop Tacit will be available in 50 ml Eau de Parfum. Look for it in September. Update: the description from Aesop..."Tacit is at once familiar in its citrus notes and distinctly contemporary in liberal use of Basil Grand Vert. And as the title implies, somewhat elusive in character – more readily experienced than articulated. The formulation was born of two key inspirations: the fresh notes found in traditional colognes; and the culture, topography, and fragile, perfumed vegetation of the Mediterranean coast."